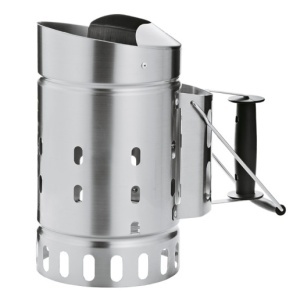 The design of this chimney makes it fast and easy to light a charcoal fire without lighter fluid. The large size prepares enough coals to grill for hours, so this is a great tool to have when you’re cooking outdoors for a crowd. Adequate ventilation on walls and bottom allows charcoal to light evenly and efficiently. No lighter fluid required – use paper and matches. Shield prevents hot embers from escaping when pouring out coals. Will develop a deep patina with use; this does not affect the chimmney’s performance.